Fourteen patients with duodenal ulcers and eight healthy volunteers were examined to measure interdigestive gastroduodenal motility and plasma motilin. In order to study the effects of gastric acid on the gastroduodenal motility, 20 mg of famotidine was administered intravenously. The motility index of the gastric antrum and the duodenum, as well as the pH in the duodenal bulb were calculated. 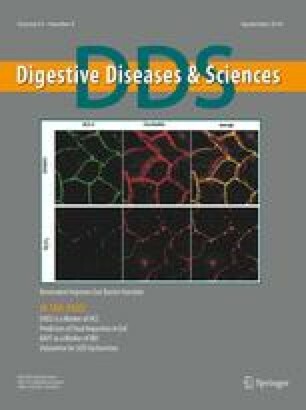 The duodenal pH was significantly lower and the gastric motility index was significantly weaker before the duodenal interdigestive migrating complex (IMC) in the ulcer patients than in the controls. Motilin levels increased before the duodenal IMC and decreased afterwards in both groups. Famotidine significantly increased the duodenal pH and the gastric motility index before the IMC, but no changes in the motilin level were noted. We conclude that duodenal ulcer patients have duodenal hyperacidity that results from increased inflow from the antrum and antral hypomotility during the gastric IMC and that these changes are normalized by the administration of famotidine. These results suggest that gastric acid inhibits antral contraction during the gastric IMC.